A quiet week looms for Ballymore stables but we are hoping that our two runners in New South Wales and Victoria - Lord Disick and Habitual Offender - will acquit themselves well. Looking good when breaking his maiden at Warrnambool late last month, Pentire three-year-old Lord Disick heads to Kembla Grange on Tuesday - lining up in the Wollongong Harbour Class 2 with Christian Reith aboard. Drawn the inside gate, Lord Disick rises in class but the main concern for Michael Moroney is the track which on Monday evening was rated a heavy ten. "He is going really well but the going is the question mark." "He did win a trial in heavy conditions in New Zealand but we wouldn't say he loved it." 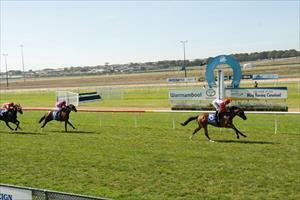 Wednesday racing heads to Geelong where Habitual Offender is topweight in the Geelong Australia Handicap over 1700m. A game second after covering ground at Bendigo a couple of weeks ago, the Guillotine four-year-old is suited up a bit in distance and he strips fitter for his last two runs. "He has drawn out a bit," Moroney conceded, "but it looks a nice race for him and he is down in class."